Without request I am submitting a letter of reference for the products and services received from J.M.L. at my home in 2014. 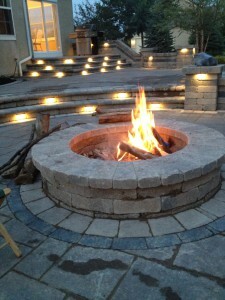 The investment we made to our home in the form of a patio and fire pit area are significant from a cost standpoint, but we have dramatically increased and improved our outdoor living space and have had many enjoyable occasions since its completion. The workmanship and skill of the team, as well as the customer friendly nature of each person involved made this project a very positive experience. Personally I work for the largest and most established landscape company in America, so I can very unequivocally speak to the skill that this team represents. We have areas in the country where we have craftsmen with similar abilities, but they are few and far between. Finally, they offer a five year warranty on materials and craftsmanship. My patio was completed in mid-summer, but we just had a block on the fire pit come loose due to extreme heat damaging the adhesive. I notified them over the weekend and they were at our home first thing this morning fixing it. If you want the finest in quality hard scape construction you should pick your contractors carefully in this area, and I would tell you that it would be tough to find better than J.M.L. June and I want to thank you and your employees for working with us on our patio design and construction project this year. We had seen work by other companies and the designs mostly seemed unimaginative and drab. After just talking with us a short time you were able to come up with a truly excellent, artistic, and beautiful design for us. When built our patio/living area was inviting, comfortable and useful. We spend a lot of time there and still can’t believe how it turned out. You were recommended by other contractors who had seen your work and by a neighbor (also a contractor) who had used you when he built his dream home. They were not wrong in recommending you. We have to say something about all of the guys who worked for you on our project. They were friendly and helpful and understanding and were a wonder to watch. They are true artists with stone and landscaping. Thank you for everything and we wish you and the guys the best! We have used JML Landscape Development for three different projects from 2010 to 2013. The first project was a complete renovation of our front entryway, which included a paver patio, large retaining wall, paver sidewalk, and all new landscape. The second project in late 2011 involved creating a living space in the back of our home that included a new paver patio, paver steps, and a retaining wall around our air conditioner. They also created a beautiful natural privacy wall of Canadian hemlocks, holly bushes, hydrangeas, and dogwoods. This was a small, useless area that has become a haven for us. This summer we asked JML to return to add a flagstone walkway connecting the front and back of our home along the garage side of our home. I cannot begin to tell you how professional this landscape company is on every level. The design work is beyond what we could have ever imagined. It is not ordinary…it is strikingly beautiful. But more importantly, the ethics of this company is unlike any company we have ever used. They are perfectionists. All the employees work as if they are working on their own home. There are no shortcuts taken. The work is done so it will last for many years. We had a very difficult 5 ft. retaining wall that had to be built for our front entryway project. Interlocking blocks were used…each weighting 80 pounds…to assure us that this wall would not give way from pressure over the years to come. We also had curved paver steps added to connect this front area to our deck. This total project cost approximately $15,000. It was so complex that when it was finished, we felt it was really quite a bargain. The second project for our back area added living space that did not exist before JML designed it for us. This was another large project. We had a very small, slopped yard that we had been unable to use for anything. Now we have a beautiful paver patio for dining, relaxing, and family gatherings. It makes that space seem three times as large as it was before. The best part of the design is the wonderful soft landscaping that creates an oasis to give us privacy. This project also solved another ongoing problem. We had water erosion on this part of our property, and JML graded it and added cobblestone. This solved a problem we have had for 10 years! The third problem just added a finishing touch with a flagstone walkway. We love it! We cannot recommend JML Landscape Development enough. They are honest, talented, and extremely reliable. The owner stops by occasionally just to check on his work. We have had to replace a couple of trees, and all it took was one call to say we had dead trees. New trees were planted without question. Soft landscape is guaranteed for a year. JML also guarantees all hardscape work as well. This is a small landscape company that does amazing work. We have referred them to many friends who are equally as satisfied. I would encourage you to use them for whatever work you need done…large or small! It is a great feeling to know the work will be done correctly, with pride!!!! Also, we felt the workers were so honest. We could leave the house and never worry about them being here working alone. I cannot say enough about this company!